Preheat oven to 350. Lightly grease cookie sheet. Line the baking sheet with the bottom halves of the slider buns. They should cover the pan. In a large skillet add 2 TBSP of the salted butter. Thinly slice both onions and place into skillet on medium heat. Cook until onions are caramelized …about 20 minutes. While the onions are caramelizing prepare your venison in a separate bowl. Add 2 lbs of ground venison, 1/2 TBSP Worcestershire sauce, 1 TBSP beef base and salt and pepper to taste. Mix well. Once the onions have caramelized add in the venison. Cook until the meat is nice and browned. Melt the remaining stick of butter in a small bowl. Add in 1 TBSP beef base, 1/2 TBSP Worcestershire sauce and at least 1 TSP each of the onion and garlic powder. Set aside. Once the meat is fully cooked add in your chopped Gruyere cheese or shredded white cheddar cheese with the onions and mix well. The cheese should melt nicely and hold the venison together. Scoop the meat, onion and cheese mixture over each of the slider buns on the greased cookie sheet. Cover with the top buns. Using a pastry brush, brush the buttery mixture over the top of the buns. Sprinkle the buns with onion and garlic powder. Bake the sliders for about 20 minutes until the buns are browned and cheese is melted. Enjoy! Easy meals made at home. 1 lb ground Venison. 1 package Old El Paso Chile & Roasted Garlic Mild Mexican Cooking Sauce, 8 oz. Brown Venison in skillet and add in the Old El Paso burrito sauce. This is the best burrito sauce I have ever tried and I’m hooked. 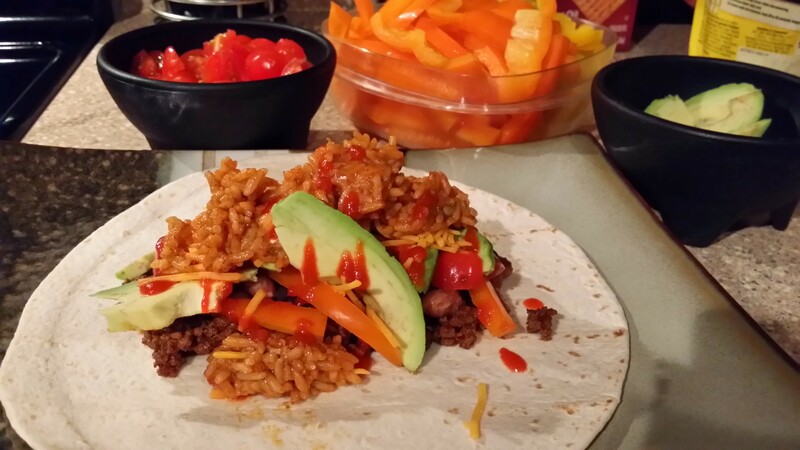 For toppings I use fresh Avacado, raw bell peppers (yellow & orange), tomatoes, Spanish rice, black & pinto beans, sour cream and light cheese topped with the amazing Sriracha hot sauce. Enjoy! Venison Loin Chops with Roasted Carrots, Spinach & Mushrooms. Side of Prosciutto Wrapped Asparagus drizzled with olive oil, sea salt with cracked pepper and fresh garlic cloves. Protein packed meal for someone looking to cut down on carbohydrates. This is a healthy and delicious pairing of meat and veggies.